So guess what I was doing at 2AM this morning? Yep, Zesting! I don’t think that I’m a total weirdo, just a person who can get sucked into a fun project…and boy was I sucked! 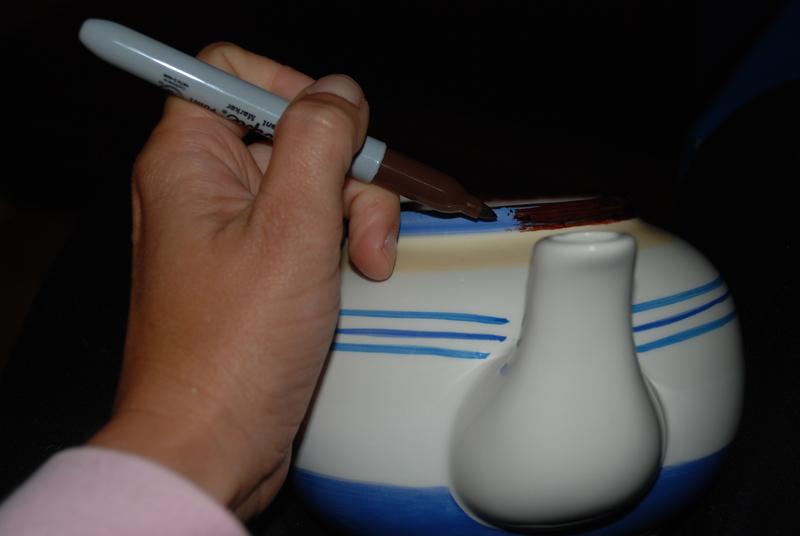 I have been seriously tempted to bust out Sharpie markers ever since finding this post on Pinterest showing how to permanently design with them on glazed ceramic….come on, who wouldn’t want to create their own designs???? 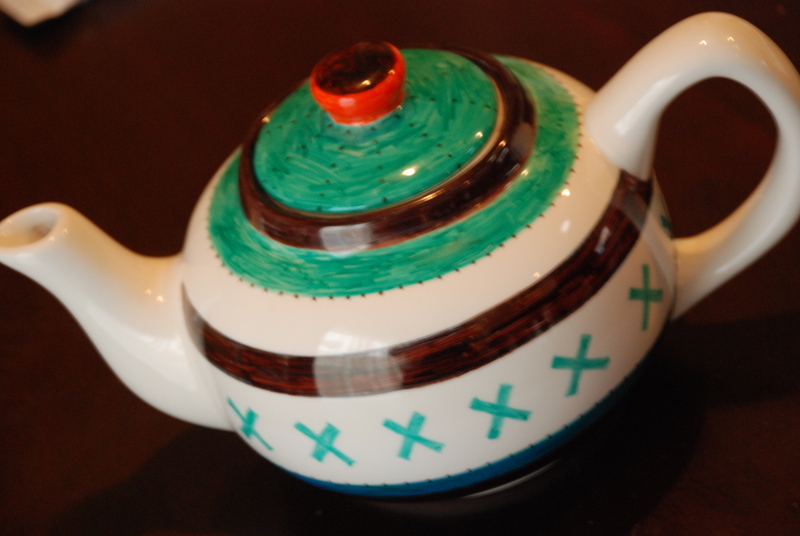 Move over Hot Pottery!! We are gonna start having ceramic parties at home…with a bottle of vino, good music and lots of laughs (not to mention all the good creativity vibes). Of course, I had to try this the Zest it Up way….no quickie runs to the store to hunt down perfectly white plates. 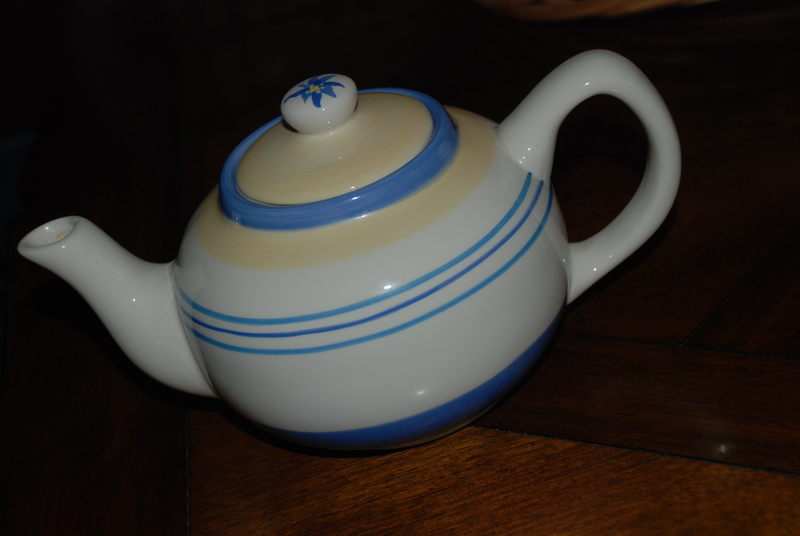 Nope, just a quick run to the cupboard to find this outdated teapot that was perfectly due for a transformation! 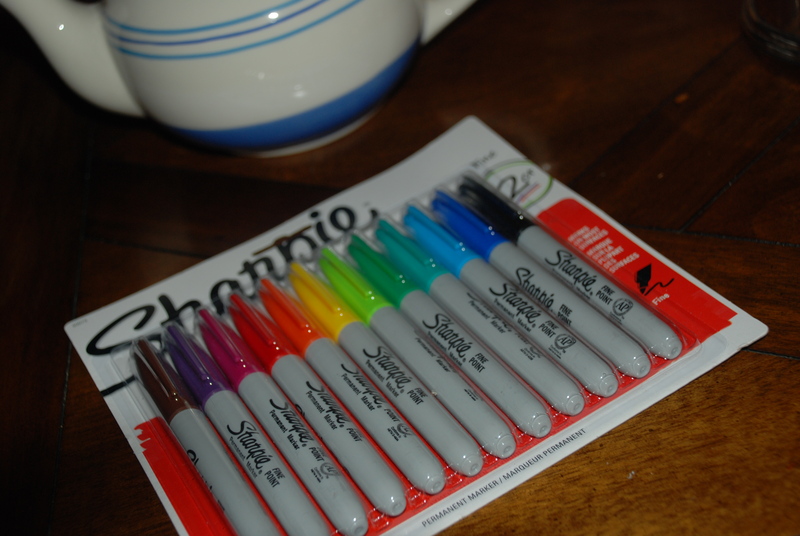 Enter the Sharpies! I picked up the generic color assortment for less than $10…figured that this could be the start of something new 🙂 Now, time for the fun part: color and doodling..so much fun! I kinda felt like I was in high school again (umm, yes, I was an excellent student…but even then I had to multi-task with some truly fab doodling skills…har-har, guess that is how to unlock my brain). So, last night it was the turquoise and brown calling out my name from the packaging. I went with brown to cover the blue, so that it would cover and have no peek-a-boo colors showing through–I saved the turquoise to cover the super pale yellow. Major important thing to remember is to start at the top and work you way down your design, because the Sharpie ink will be a bit tacky, sticking and smearing before it’s baked. Soooo, start at the top and work down if you don’t want a mess. 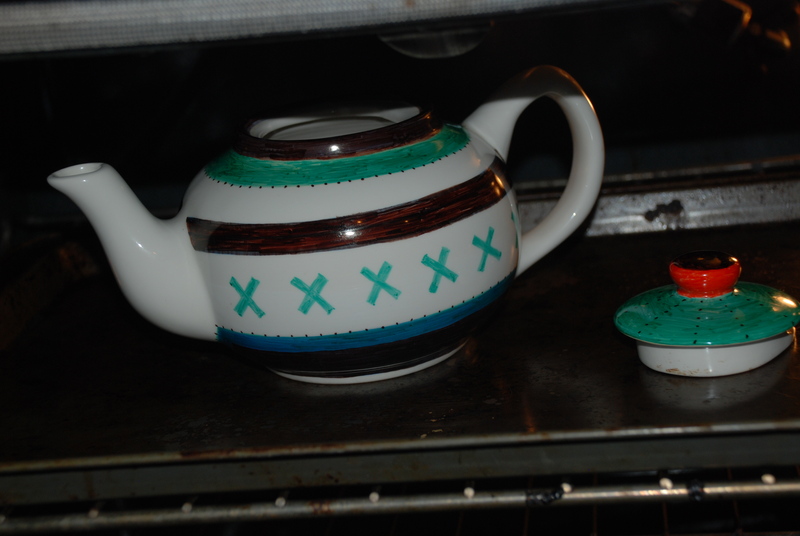 Now for the most important step, place your ceramic on a cookie sheet and bake it at 350* for 30 minutes. I think the end result turned out so fresh and cute. 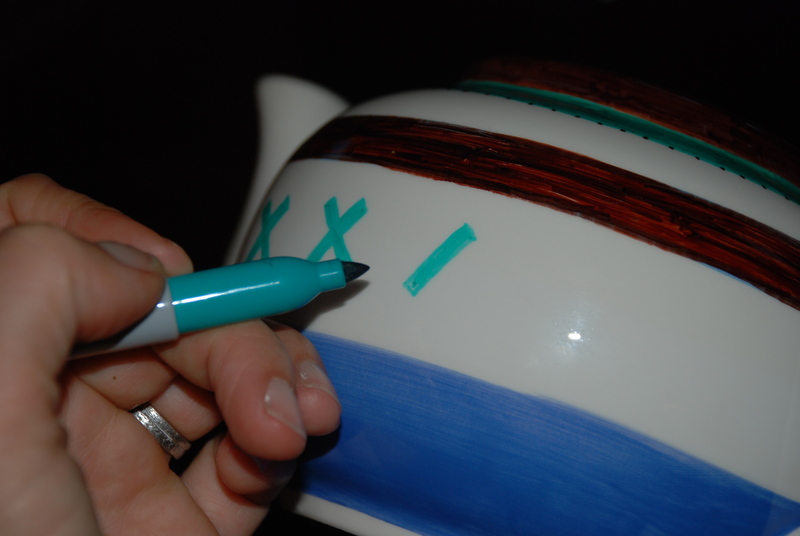 I love the pop of orange on the lid, it totally gave the piece some Zest. And, is washable!! (Still gotta try the ultimate test of running it trough the dishwasher). The sky is, literally, the limit with this project. I am ready to hunt some “new” pieces down at the thrift store and garage sales, STAT.